"Fictionalised diary of Amy Dyer who is caught up in Cyclone Bola in Gisborne, 1988. Amy is a twelve-year-old Auckland girl whose parents have left her to stay on a vineyard in Gisborne with relatives while they go on a sailing trip. Cyclone Bola strikes, sending the area into ch... read full description below. 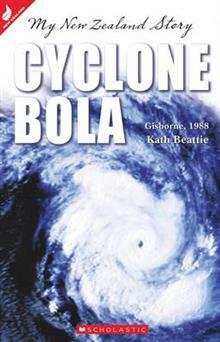 March 2013 marks the 25th anniversary of Cyclone Bola, one of the costliest cyclones in the history of New Zealand. When Amy's parents decide to go and sail a yacht back to NZ from Vanuatu, Amy is sent to stay with her great uncle and aunt on a vineyard near Gisborne. When reports of Bola start coming through, Amy's initial worry is for her parents ... then the cyclone moves closer, and strikes the East Coast of NZ with devastating effect. A former teacher, Dunedin-based Kath Beattie is now retired but is a keen outdoors person who has travelled and lived in many countries. Kath has authored one other title in the My New Zealand Story series, Gumdigger (formerly My Story: Poor Man's Gold).